It was on a cold winter night back in 2003 when I first landed at the JFK airport. 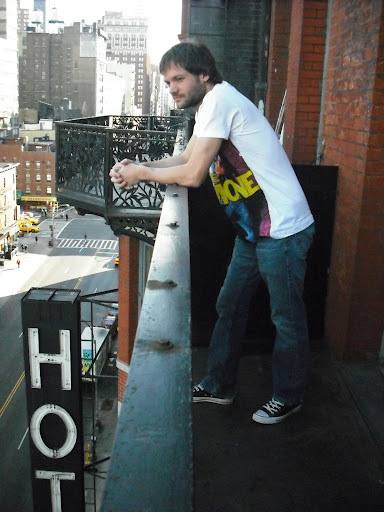 A 25 years old French guy freshly done with grad school, I had been spending the previous few months completing a master thesis on the New York punk rock scene of the 70s and Dee Dee Ramone’s Chelsea Horror Hotel novel. Of course, when I first considered it, my peers thought I was plain suicidal for taking the risk of dealing with a subject certainly way out of the usual path, but what else was new? Always somewhat of an outsider, I could never follow the white lines neatly painted on a boring straight road of conformity. Great things rarely happen without taking a risk. I had been informed that I was welcome to tackle the subject as long as I could prove that it had a cultural and social value, and as far as I was concerned, it was just as important as all the Shakespeares or Frosts they want you to read…it certainly had had a bigger impact on my life than whatever we are supposed to study. It came from the heart, so I took a risk. As a result, I proved my peers wrong, and got my degree. Having extensively written about it in my work, and considering the history of the place, it seemed only normal that, once out of the airport on my very first night in NYC, I would go pay a visit to the Chelsea Hotel. To me it represented much more than just a physical landmark; I had to stop by because of what it meant to me. It was actually my first time in the USA but it shouldn’t have been. As a matter of fact, I had had previously planned a trip to Seattle to see Dee Dee Ramone perform live, as fate would have it Dee Dee passed away 10 days before the set date for the gig, and only two days after I had sent an email through his website to let him know a fan would be making the trip all the way from France to see him. And so it never happened, and I ended up writing my thesis in his memory…now you see why I had to do it. When I finally reached the Chelsea on that cold winter night after a 7 hours flight, I sat for a while in the lobby thinking about everything and everyone I had to think about. I told you, to me the Chelsea was more than a hotel, and it was somewhat part of me already, a material representation of what made me who I am. I didn’t sleep there that night, I didn’t have the money for it, but it was important for me to see it anyway. Soon after, I was invited to join the writing staff of a well-established NY punk rock paper, and from then on the following few years flew by. From writing and photographing bands to organizing shows, becoming an A&R for an independent label, getting Heartbreakers’ very own Walter Lure back over to Europe for the first time in 25 years by co-organizing a short tour back in 2007…I did it all and met lots of my all time favorite musicians in the process. Some sort of a DIY underground success-story if you will, just without the money but that was never the idea. I ended up celebrating my 30th birthday at Don Hill’s in 2009 with Cheetah Chrome & the Blackhearts, Walter Lure, Daniel Rey with the Martinets, the Bullys, Electric Frankenstein, NY Junk, etc …and then…then I played bass for Ramones songwriter Skinny Bones for a while…Not too bad for a French kid who was just going to spend a short vacation in NY. Of course the ride that took me there was a bumpy one, and it only got tougher and tougher for the scene and for me…but I’m still here. I haven’t given up just yet. It’s not like me. When my old high school pal from France Stephane decided to visit for Christmas in December 2010, I figured we might as well do it the right way, so I figured “why don’t we stay at the Chelsea for a couple days”. In all honesty it was more like daydreaming than reality, but when I mentioned it to him, he was all for it. 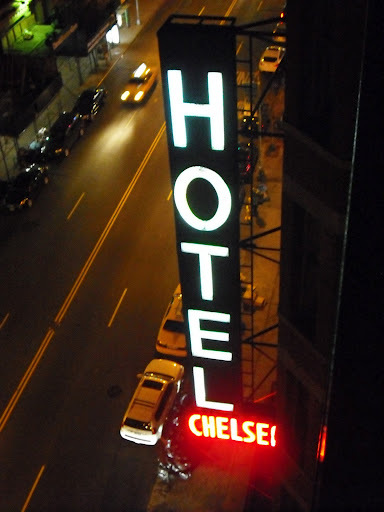 So on Monday December, 20th 2010 we checked in at the Chelsea Hotel, some 7 years after I originally sat in its lobby. This time around I made it all the way to the front desk and we got our key. Soon we reached our room on the 7th floor and I was as excited as one can be when we dropped our bags and opened the windows that revealed a small balcony with view on the front street. The Chelsea Hotel sign all lit-up, and only stars above us, “I finally made it here” I thought to myself, and, strangely, for the first time in years I actually felt at home…I was at home. I told my friend lots of stories about the Chelsea, Dee Dee, Sid, and all the famous outcasts who walked through these doors as we wandered in the hallways looking at the paintings and photographs that decorate the place. The two nights we were supposed to originally spend at the hotel turned into four, until he had to fly back home.. When we finally checked out, I fantasized about how life would be if I could be living there, if it was the place where I was going back to every evening. I looked over my shoulder to give a last look at the building before heading back to my apartment in Brooklyn. It took me seven years to finally spend a few nights there, but I did. Less than a year later in August 2011, the Chelsea Hotel closed to guests and for renovations. They will be turning it into another fancy place for the wealthy and it will be left to us to remember it just like we remember all the places that made NYC what it was Max’s Kansas City, CBGB’s, Continental, etc. all gone, and going.